In this short descriptive novel, young readers meet five-year-old Charley, the youngest boy in an Appalachian family, who, during six weeks of the summer, will attend Little School for the first time. His older siblings have all been through Little School already, and they tell Charley how much fun he will have there, but they also warn him that only the very best-behaved student gets the honor of carrying the flag at the end of the day. 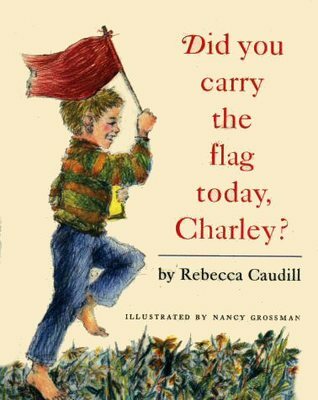 For the first few days of school, Charley's mischievous tendencies prevent him from being chosen to carry the flag. Things change, however, when the school librarian takes an interest in him and finds a way to spark his desire to learn. It's hard to describe this book without making it sound like educational propaganda for kids, but I was actually pleasantly surprised by how sincere and child-appropriate the story really is. Charley is a completely believable five-year-old boy, and his realizations about the importance and relevance of school come about in a completely realistic and age-appropriate way. Though the librarian is the catalyst for his understanding of what education is really all about, she is not presented as someone who sees herself a hero. Rather, she comes across as a genuinely caring adult who happens to connect with a student by doing her job well. I did cringe for a moment when I saw the potential for this to turn into a Very Special Librarian story, but Caudill deftly avoids this trap and maintains a sense of respect for her readers even at the story's most heartwarming moments. It is a little bit tricky to pin down an audience for this book. Since Charley is five, and the story is relatively short (with lively pen-and-ink illustrations to break up the text), it might make a nice read-aloud for preschoolers and kindergartners with the attention span for short chapter books, especially if they are preparing to start school. For most kids who can read this book on their own, however, Charley is very young to be an appealing protagonist. Still, the quality of the writing is very good - Caudill reminds me a lot of Betsy Byars - and the Applachian setting is intriguing to those who have not lived in such a place. It's definitely a book worth owning provided you have a child who is likely to enjoy it.